I have decided not to allow the irritation of one person to spoil the open forum for interaction on my blog. I have removed all trace of his views and blacklisted him. We are strangers here and the least that we can expect of each other regardless of our views, is respect, courtesy and dignified expression. You fall short; you fall out. Closing Comments Update - 1st November 2013: In view of certain recent developments in the comments section of this blog, I have decided to close this blog to any new comments. A more comprehensive note appears below the text of the blog. Update – 26th July 2013: Having had so much traffic to this blog, it has become necessary to add more information and references about the quote, the context, the person and the somewhat ulterior motives that seem to govern the release of what I might refer to as "Internet Apocrypha". I will advise anyone who is thinking of commenting on this opinion piece to first exhaustively go through the links provided within and below the article and appreciate the import of each submission, and then, if there is any desire to debunk any of the claims, please provide reference, attribution and accessible sources to support your views. A few hours ago, I came upon a picture taken of a supposed speech made to the British Parliament on Facebook and the healthy sceptic that I am had to review the content to determine if this was true or not. A quick search, though inconclusive proved my doubts and though I left a comment on the feature, soon afterwards the posting was removed in its entirety along with all the opinions expressed about it. That is probably what I fear the most about participating in the many forums on the Internet outside my control, the sudden disappearance of an opinion, a view or a comment so succinctly made at a moment in time representing my contemporaneous thinking which I may never be able to reproduce if it is lost. This informs the reason why I mainly stick to writing on my blog where my views cannot be tampered with by editors or syndicators – my cubicle serves its purpose well. Now, with regards to the picture above and the words transcribed there is probable cause to believe that there was intent by the British Empire as it spread its tentacles in the 19th Century; I had my doubts that they were expressed as such, especially in Parliament. Sensational and inflammatory as it definitely is, it can be used to whip up nationalist fervour and jingoism for the ways in which colonialism and imperialism raped the colonies but if we are historically incorrect in attempting to harness a sentiment for polemics and so political gain, eventually the truth of such manipulation will be revealed, but long after the mob has been excited to wreak havoc on our peace. Now, this speech was said to have been made by Thomas Babington Macaulay, 1st Baron Macaulay on the 2nd of February 1835 to the British Parliament. This would have been difficult, if he left for India in 1834 and returned in 1838 serving on the Supreme Council of India. This was not a journey to be taken lightly if you were based in India in the 19th Century; it is quite unlikely that T. B. Macaulay made a speech to the British Parliament in 1935. Then one might ask how this got attributed to him. He did take minutes on the 2nd of February 1835 on the issue of Indian Education but those minutes do not contain the said words, it is suggested that the words might well have been an embellished paraphrase of a number of opinions that the man might have expressed in different documents and letters. “The Company officials were divided on the kind of education to be promoted – will it be the indigenous system of education, or a new education system patterned along the British system of education.” The context of T. B. Macaulay’s minutes a subject of the English Education Act of 1835 were implemented in India in 1854 was advocating the promotion of European style education over the indigenous system. There are other words that are apparently attributed to Lord Macaulay and this follows the thinking of colonialists of that time; on page 325 in Essays, Critical and Miscellaneous, by Thomas Babington Macaulay, Baron Macaulay, we find the paragraph below as also corroborated in Callaloo Nation, by Aisha Khan. This reads no different in context and understanding that Lord Lugard proffered of Africans in his book, The Dual Mandate in British Tropical Africa in 1922, where he said, “In character and temperament, the typical African of this race-type is a happy, thriftless, excitable person; lacking in self control, discipline, and foresight ...” I covered this in my Apes Obey Series. I expect the picture to go viral as it gets shared and commented on by readers on Facebook, Twitter and other Social Media forums, it might even catch the eye of some newspapers on its way to becoming a meme, many not bothering to verify the information and ascertain its provenance, veracity and correctness with historical fact. As to the exact words spoken or written by Baron Macaulay, many of which might be in dispute, one can only end on the damning excoriation of taking things at face value exemplified in these words authored by someone who did not sign their contributions to this debate. “Available in the archives to genuine researchers. Not for followers of the ‘If it cannot be Googled it did not happen’ doctrine.” I hear you. In response to a comment that was posted recently, this piece was attributed to Lord Macaulay in 1835, well, in 1835, he was Mr Thomas Macaulay, he did not become Lord Macaulay until August 1857, which would suggest this was an attribution as a reported event rather than diary event, else, the postscript would say Mr Thomas Macaulay who became Lord Macaulay. There is no reference in the Hansard of any speech, address, opinion, bill or comment by Mr Thomas Macaulay in the years from 1834 to 1838 inclusive. Talk:Thomas Babington Macaulay, 1st Baron Macaulay – The WikiQuote analysis of this purported speech. Thomas Babington Macaulay, 1st Baron Macaulay – The Wikipedia entry. Biography of Thomas Babington Macaulay – From Spartacus Educational, here, it noted that he was ennobled in August 1857, that is when he became Lord Macaulay. 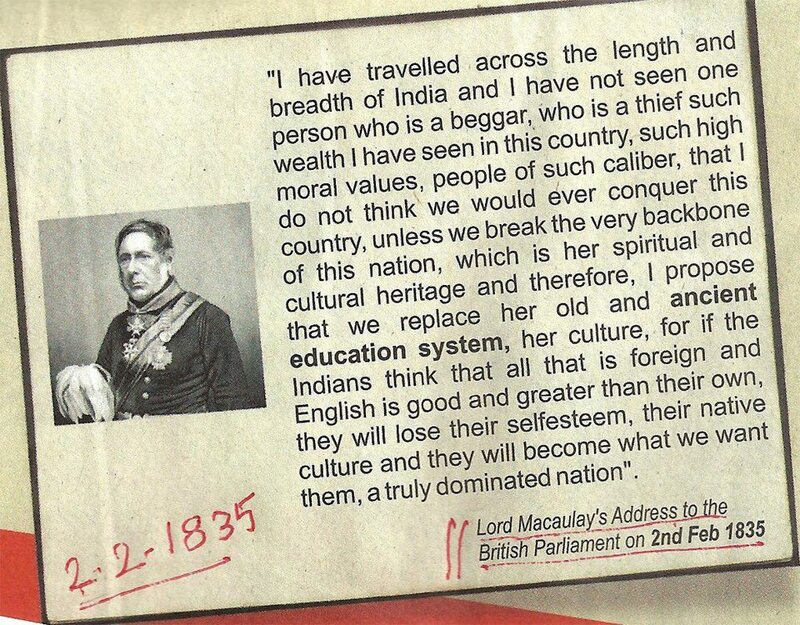 Minute by the Hon'ble T. B. Macaulay, dated the 2nd February 1835. – From Bureau of Education. Selections from Educational Records, Part I (1781-1839). Edited by H. Sharp. Calcutta: Superintendent, Government Printing, 1920. Reprint. Delhi: National Archives of India, 1965, 107-117. Macaulay's “Minute Upon Indian Education” In the English Education Act 1835. – Wikipedia. A dubious quotation, a controversial reputation: the merits of Lord Macaulay – An exhaustive study of Lord Macaulay by Koenraad Elst – This must be read. Lord MacAulay’s Speech to British Parliament 1835 – Robert Lindsay on whipping up nationalist sentiment with contrived and false quotes. After almost 6 months of having written this blog with over 6,000 reads and all together 39 comments, I have decided to close this blog to new comments. I appreciate everyone who has found time to read what I have written and have left comments either in support of or against the views expressed here. Many, times, I have reiterated that the purpose of this blog is to dispute the letter of quote attributed to Lord Macaulay; at no time, I have suggested that colonialists have not practiced the spirit of the forgery attributed to the man. Recently, the comments have digressed from the purpose and context of this blog; they have become unhelpful and do nothing to further the debate. I did not write this blog to entertain idle retired trolls. I have suffered his views for long enough that I have decided to close this blog to new comments. Everyone has a forum in the greater, bigger world of the Internet to publish their concurrence or disagreement and link back to this blog, if they so wish. Thank you for reading and visiting my blog, I am honoured if providence has led you here whether you have gain anything or not from reading my blog. Dude the pic and topic you have mentioned above were part of Lord Macaulay's personal diary. So correct your statistics first ! Why you have not responded to Shri Gagandeep Singh's observations Mr. Why Don't you correct your statistics as advised by Shri Singh. This might have been collated to put in Lord Macaulay's diaries, but a diary will have hand-written text, not a cut-out annotated with a date and a personal photograph as seen in that picture - that is at best an attribution to the man, it does prove that he said it or wrote it. Mr Thomas Macaulay did not become Baron Macaulay until 1857, so this is a reported event rather than a diary event, probably something added to the archive of the man after his death. I stand by my assertions, Lord Macaulay was not in the UK before the British Parliament in February 1835, he was in India. That is what this title of this blog avers with clear indications as to why. If you want to proffer a new argument, provide more authoritative sources to debunk the view. Thank you, there is nothing to correct here. You are right the address by Lord Macaulay is a cheap fake. The font used is a modern computer font that did not exist in 1800's or even most of 1900's. The forger has tried to make his note look genuine by using antique paper background and red lines etc. but forgot the most basic of things the font. The fact is that India has been low on moral character much before the British came, for more than a thousand years, perhaps since the decline of the Buddhist empires and destruction of Institutions like Nalanda University (the first university in the world that has recently been revived) Just the fact of forgery speaks volumes for the moral character of those who did it. I have no particular opinion on the English Education Act of 1835, however, the implementation of that act did not come about in India until 1854. The main focus of this opinion is to demonstrate that the said address did not happen, other experts can address your question if the references I have provided do not. Thanks for your comment. The main purpose of this opinion was to suggest very strongly that this address did not take place. Knowing the sentiment that the piece has attracted, I have refrained from using strong words but provided as much evidence with the hope that a clear and open mind will come to the determination that the provenance of the said speech is suspect and thereby possibly a forgery. Commentary about the political, social and economic consequences of what the British did in India, I will leave to others. Very well spoken Akin. What was the impact of the British on India is a vast matter for debate but probably as with everything else of this world it is a mix of good and bad perhaps. my personal opinion though is that the good outweighed the bad,but as I said it is a matter of debate and opinions will differ. However forgeries like this one distort the debate as did some assumptions about ancient history by European historians. We need contributions such as yours to sift out the falsehoods. Great contribution. Thanks. I STAND TO BE CORRECTED THOUGH , BUT YOU FORGOTTEN YOU CAN ADDRESS PARLIAMENT WITHOUT YOUR FISCAL PRESENCE AND HOW ARE YOU SURE UR SOURCE THAT MACAULAY WAS IN FACT IN INDIA AT THAT TIME ? AGAIN ARE YOU SAYING HE DID NOT SAY THAT? known as Minutes on Education. However, all these facts do not detract from the fact that the quote doing rounds here is NOT Macaulay's. It is best to follow logic rather than sentiment, in addition to that, it is important to have some comprehension of the detail before you comment or the lesser will be thought of you and your views. Addresses made to parliament will be referenced in the Hansard, but in this case for the date mentioned, minutes were taken in India, no address was made to parliament. No, it does not help, the reasoning is muddled if not convoluted. The premise of this blog is to assert that the excerpted quote as appears in the graphic is a forgery, that the said words were never recorded as spoken in that way, that no address was made to the British Parliament either in Britain or in India on the 2nd of February 1935 and that any other related speeches are archived for referencing for those willing to search for the truth rather than be carried away by sentiment. There is nothing wrong in leaving two separate comments, but to pretend to be two separate people is a bit foolish, except if two of you decided to share the same computer with the same email and IP address and Discus identification, 14 minutes apart. Frankly, one is not impressed, but something always compels people to display some silliness eventually. I'm gonna agree with you on this. I found the initial post on facebook a bit far-fetched to begin with, but I went ahead a researched it in my online University library. According Catherine Haul in Macaulay's Nation, not only was Macaulay still in Calcutta during 1835, but he had know such view of India. He believed Indians to be barbarians that were religiously fanatical and had no ability to self-govern themselves, at least not anytime in the near future. He didn't understand India, the culture or the people and believed them to be backwards and very easy to rule. Either way, thanks for reminding me Akin that the internet can be dangerous if we just accept what we see without proper research... and by proper research, I mean Google is not involved in the process. If anything, the purpose of this blog is collate all commentary about the address and event regardless of whether the commentary is positive or negative. Robert Lindsay for his supposed anti-African views has every right to be heard and read as much as those with pro-African views. For instance, I referenced Lord Lugard who said the most reprehensible things about Africans, but within what he said are some uncomfortable truths - truths we must never be afraid to face. Fundamentally, I am not here to whip up or promote sentimentality, but to offer a forum for an honest exchange of the broadest range of views. I have no idea what this language is and it is not detectable by Google. Sorry. It is not a proper language but a frustrated and racist Indian man abusing you (in Hindi language but writing it in English), cause he's feeling weak with his limited knowledge to defend the views in the viral message. Your honest and straightforward approach seems to be the best way to address such Issues. Thank you! Torgbi (or KK) How are you so sure about the existence of this document/speech having presented no proof whatsoever? You are questioning a combination of approx 80% proof and 20% logic. If you just want it to be true, you'll anyways believe it, why waste your sorry life on this useful blog. 'Shri Singh' made a statement supported by no proof and then you supported him, this mentality is the very reason a non-Indian had to prove this to you (in today's globalisation even that is to be appreciated), and now since Akin found an answer to his 'observation' neither he nor you had the modesty to thank him for his efforts. Your name should be a ringing reminder of where you are heading with your kind words. Shame on you! Thank you for translating this, whatever he said, it does not take away from the facts and the truth. @karma Learn to respect others a little atleast. And don't try to loose your own self-respect. They stole our cultures and left their nonsense to us and we feel proud for it. The present generation doesn't know the cultural lesson and their values. We need gurus not teachers. Nobody stole our culture, else, that culture will be practiced by those who stole it. We abandoned our culture and forgot the fundamentals of what bound us together as people, our underpinnings were weak. We don't need gurus where we lose the ability to think, debate, question and understand in the blind followership of demigods prone to error and demagoguery, we need teachers, people who encourage us to reach to reach beyond ourselves to be greater than we ever thought possible. We must start with understanding who we are and then appreciating where we came from. "Guru" means "Spiritual teacher", the problem with spiritual teachers is already defined in my original comment about Gurus, they are answerable to no one, accountable to no one but some higher authority and can act with impunity, the victims getting no justice for offence. I stand by the original statement, we need no gurus, we need teachers of spiritual and cultural truth, not cultural spiritual teachers - I hope you understand the subtle but obvious differences. that would be used by all Christians as the word of God. The Church leaders gathered together at the Council of Nicaea and voted the "word of God" into existence. The final version of the Christian Bible was not voted on at the Council of Nicaea, per se. The Church leaders didn't finish editing the "holy" scriptures until the Council of Trent when the Catholic Church pronounced the Canon closed. However, it seems the real approving editor of the Bible was not God but Constantine! OK so WHY does Macaulay utter this nonsense: " I have no knowledge of either Sanscrit or Arabic. But ............a single shelf of a good European library was worth the whole native literature of India and Arabia. The intrinsic superiority of the Western literature is indeed fully admitted by those members of the committee who support the oriental plan of education." These words are from his published speech. India soon after independence adopted a socialist/self-sufficient slant for decades before you began to open up your systems and economy to globalisation. The fact is the extremes don't work, you have to find an accommodation for what is essentially cultural (Indian) and what is 'foreign' (global) to progress. The issue here, regardless of the history that we try to latch our nationalism and jingoism on is, since 1947 you had determination and purpose for the direction you want for India, to arrive in 2013 looking for excuses is unfortunate - the rest is just argumentative and it does not change the premise of this blog (facts are paramount) nor the responsibilities we have to ourselves once we understand where things when wrong. Macaulay said a lot of things, but we must know exactly what he said rather than manufacture what we hope he said to further some atrocious or nationalist cause on falsehood. journey, I'm sure! Good luck with the Blog! Apologies if you felt patronized. Older does not, necessarily, always, mean wiser but false ego certainly misleads. I firmly believe, simply based on his accepted/recorded, speeches that Macaulay was grossly misguided indeed. Evil comes in many forms, often pretending to do good. 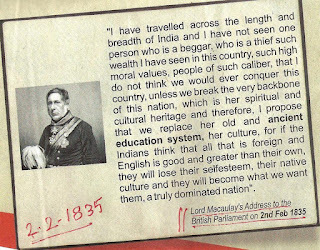 In my view this is clear when I read published speeches by Macaulay. I believe he he came from a culture with false ego leading him to behave the way he did. BTW 'Globalisation' just means 'I'll have the goods you have at a price I'll dictate'. My beliefs are based on far more solid grounds. I never disputed that Macaulay had views dissimilar to those expressed in the cutout and my blog clearly states that whilst comparing him to another colonialist, Lord Lugard with similarly odious views. The contention is, the words in that cutout attributed to him are fabricated and manufactured to push a possibly ulterior or sinister nationalist motive. I did not put up this blog to argue the views, acts or writings of Lord Macaulay, I wrote this to dispute some very basic premises. 1. Historical quotes must be verified and certified to be the truth and correct. 2. The person quoted must not be misquoted. 3. The setting of that quote, if material, must be historically correct. This cutout failed those premises. Any other argument digresses from the primary purpose of this blog and is fundamentally unnecessary. The facts once ascertained should be argued in another forum, NOT here. You, my friend, claim to be travelled and a Christian. Yet you say "......and manufactured to push a possibly ulterior or sinister nationalist motive." The British thought the same about KANU (Kenya African NATIONAL Union) and ANC (African NATIONAL Congress) in South Africa. Nationalist movement are always 'SINISTER' in the eye of the OPPRESSOR. Glad to learn where you stand on this. England, Nigeria and the Netherlands is hardly 'travelled', in my view. Distance travelled does not equate to informed judgement. Your judgement on 'the cutout' also has a gross lack of Christian CHARITY. In my view the wording used in the quote/'cut out' is TRUE, in essence & spirit, considering the intentions & policies of the rulers of India at the time. When presumably learned people like you prefer to alter facts for your convenience and for expediency in the face of manifest truth, we all suffer unnecessary carnage, you revel in corruption and can never be a beacon for justice. For all the good knowledge that might have come from your wealth of experience, you sacrifice it for sentiment and subjectivity, and that is a shame unmitigated, evil and atrocious. It is refuge of propaganda and what props up the most reprehensible dictators who feast day and night on the blood of the innocents feigning righteous causes for their bellies. If you feel so strongly about what I have written, go and write your own blog and stop trolling my space. I will no more entertain your ilk on my blog and I am of the mind to write a blog to expose people like you and you in particular in view if the comments you have written here. This will form the basis of that blog. So much absorbed of the world and yet impervious to the reforming qualities of tutelage and experience - you are the face of the injustices you portend to attack - shame on you. I think it is interesting that this speech by is very similar in essence to the Willie Lynch speech known by many black people which is now also believed to be an urban legend/hoax. Hmmm. To me it does not matter whether MCaualey & Willie Lynch were real speeches - to me those speeches absolutely reflect the deliberate psychological and spiritual breaking of non-white people to dominate them. The British definitely practice these things deliberately which is why the where able to subjugate so many people around the world. After seeing the movie 12 years a slave - i am absolutely convinced they knew what they were doing -there was no denying the evil in which they were spiritually breaking people. As someone who walks a shamanic path where we MUST deal and encounter evil in its most incarnate forms including demons, I am convinced that they were deliberately breaking the individual and the soul of a people. One of the things we very rarely do in a modern secular society is to address the nature of evil. i got to this page when i saw a post on facebook about lord macauley and started researching on my own.......and i am happy to see that someone has done it and i just wanted to add that the person in the picture is "lord william bentinck"..
Hi there, He did make such remarks, only not in Parliament. I think that was a bad guess that has got caught up in the social media churn. I disagree that you haveto be a 'nativist' to dislike the chap as Guha writes though. Those of us who value, civilisationally, the intellectual , spiritual sources in S Asia that existed before the onset of British Occupation note his contribution to the discourse.